One of our favorite other uses for Kombucha tea or SCOBYs is as a body and hair care aid. 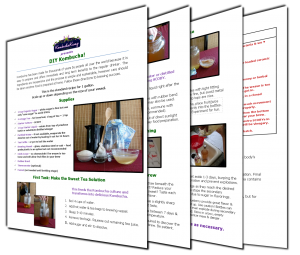 You can find some of our Kombucha Spa beauty care recipes here or in The Big Book of Kombucha. To this day, Alex uses Kombucha Hair Tonic in place of shampoo. Hannah often makes SCOBY and mud masks. And we both swear by Homemade Kombucha Soap. You can buy it at the link, or if you’re the crafty type, this Kombucha Soap recipe is just the fun project you didn’t know you were looking for! Skin is the largest organ of the human body and anything you apply will absorb directly. This means all types of beauty products such as makeup, deodorant and cleansers also impact the health of the body. As we became aware of the chemicals in beauty care products, we found healthier options. 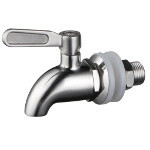 Sometimes this meant a dramatic increase in cost, but other times we learned to make things for a fraction of the cost. Enter Kombucha SCOBY and vinegar, both of which are used in this Kombucha Soap recipe too! 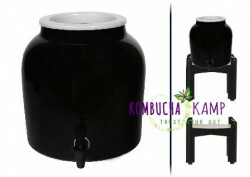 Though long known for its internal uses, Kombucha does have a wide range of external uses as well. We have used pieces of SCOBY to soothe burns, cuts and other surface wounds. We keep a jar of 30 day+ old Kombucha in the medicine cabinet for use as skin toner. Not to mention homemade Kombucha face cream! It is a natural acid peel without any harmful chemicals and this promotes circulation to the skin’s surface which regenerates the cells. 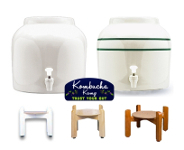 Kombucha is an acetic acid ferment, like vinegar, but with a weaker acetic acid solution (less than 1%). This mild vinegar is a natural exfoliator as the acid is strong enough to break the bonds of dead skin but not so strong that it leaves skin feeling dry or flaky. To the contrary, it leaves skin feel soft and smooth. Kombucha also produces trace amounts of beauty acids such a hyaluronic, lactic, and malic which are often found in pricier cosmetic applications and help fight age lines, spots and wrinkles. So when we happened across a Kombucha soap recipe nearly a decade ago, we needed to find some! 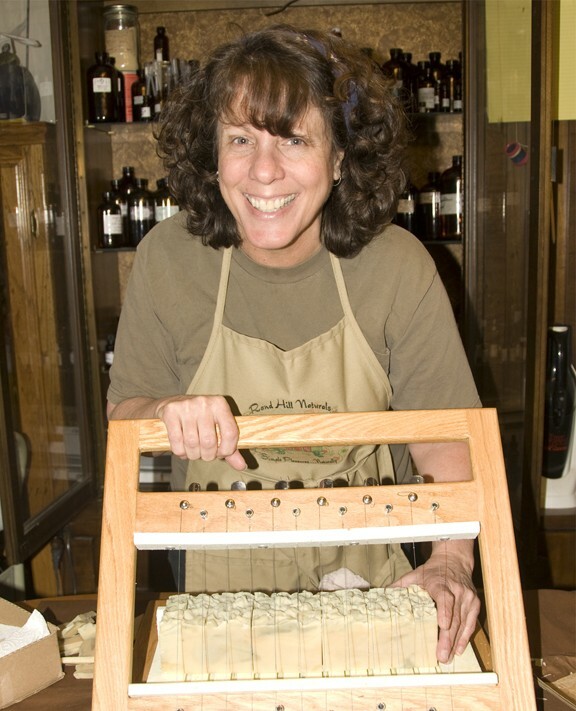 Randie works the Kombucha soap cutter. 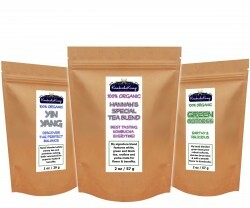 Soon after, we connected with Rand Hill Naturals from our friend Randie, and she’s been our exclusive supplier ever since. Feedback from friends and customers has been great! Many find that her Kombucha soap recipe does not irritate even the most sensitive skin. Or they find that it can also double as a great shampoo bar, especially for hair that tends to dry out easily. A Kombucha Soap Recipe is Born! For decades, Randie has been making natural skin care products with ingredients that you can pronounce, eat and might even have in your kitchen cupboard. 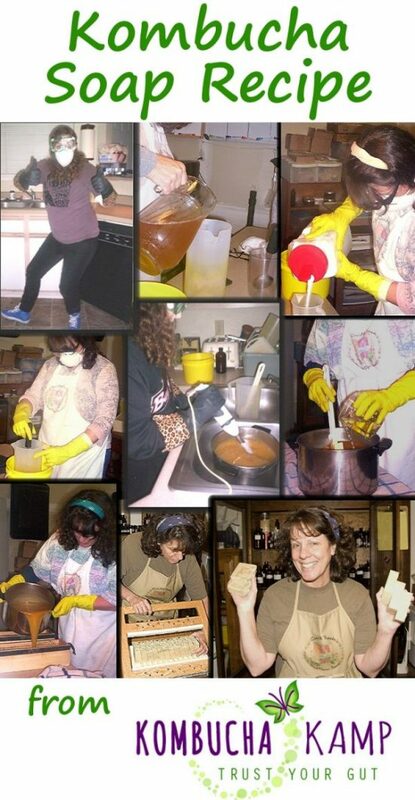 She started drinking Kombucha back in the 90’s and evolved into a home brewer for over 20 years. One day it dawned on her that developing a Kombucha soap recipe could produce a unique and healthy product. 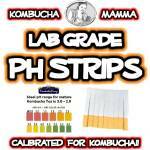 It is even lab tested to confirm the live elements remain present in the final Kombucha soap recipe. While many will prefer to simply buy their own homemade Kombucha soap from Kombucha Kamp, others may want to tackle this Kombucha soap recipe for their next DIY project. This comes right from our master soap maker. But fair warning: this is not the exact Kombucha soap recipe or process used for our product. However, it is a similar cold-process which helps to protect the integrity of the culture and microorganisms in the Kombucha. Yield: 3lbs 12oz will produce twelve bars of approximately 4.25oz after 4-6 week cure. Soap making is a time honored art that requires a solid knowledge of safe handling practices. If you don’t have prior soap making experience, then it is highly recommended to research in advance. There are numerous soap making books as well as online tutorials available. 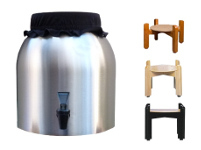 Kombucha tea has unique qualities that can create challenges. Due to the natural carbonation, it’s important to allow the gas to dissipate naturally. Additionally, any sugars that remain can cause overheating issues. To avoid these challenges, place the Kombucha in a wide mouth, open container in the refrigerator for at least 24 hours. Before you start don’t forget your safety equipment!! Gloves, long sleeves, goggles & mask. Make sure your space is well ventilated. Keep keep kids and pets, out of the way so you won’t be disturbed. Grind scoby – This can be done quite effectively with a small blender like a Magic Bullet. 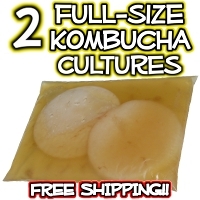 Combine 1 oz scoby and 0.5 oz kombucha tea (both at room temp). 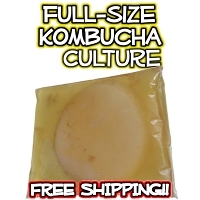 You may need to add more kombucha tea depending on the density of your scoby. You want to get a fine grain, somewhat watery consistency. Add a small amount of the combined oils in order to achieve a smoother consistency if needed. Once ground up, place in a plastic strainer to allow most of the liquid to drain. Measure and mix lye solution. Important! Remember to add the lye to the liquid – not the other way around. Label the container so it won’t be confused with a consumable beverage. While lye solution is cooling … move on to step 4. Measure and then melt hard oils first. Once completely melted, weigh liquid oils then add to melted oils. Allow oils to cool to room temperature. Weigh essential oils, ground scoby and then prepare the mold. Set aside. When the finish melting and cooling, add the ground scoby and mix with stick blender. This will help to prevent large clumps in the finished soap. Slowly add the cooled lye solution to the cooled, still liquid oils. Mix with stick blender on lower speed until you get a light trace. Add your scent and any other add-ins, then mix well. Pour into mold. You should be able to unmold your soap within 24 to 48 hours if using a log mold. Individual bar molds possibly sooner. 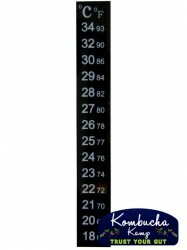 Keep in mind, the exact time may differ depending on your climate/environment. Allow to cure 4 to 6 weeks. Then, Suds Up! *Please note – Rand Hill Naturals Kombucha Bar Soap uses a different formula for their Kombucha soap recipe. I’ve made more than my fair share of cold process soap. When working with live bacteria I would most likely add those at the very end. For example, I would add the lye to the water, let it cool, then add to the oils and get a light trace…this would not only preserve the bacteria from the high heat but it would also reduce the ph between the acid and base, so they were more neutral. Not sure at what ph the living organisms begin to die off but I would say that’s worth taking a look at. At the end of a light trace between the oils and lye, I would then add my living organisms…I have never made a batch of this soap, but I am definitely interested!! Do you have kombucha soap recipes without lye? 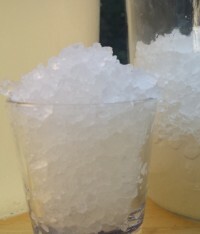 Soap requires lye to create saponification. There are pre-mixed soap bases out there that you might be able to add SCOBY or Kombucha to but we don’t know how that would impact the end product as we’ve not experimented with it that way. Send an update if you figure it out! Sounds interesting, but I’d love to see a recipe that doesn’t use palm oil. You may substitute the palm kernel oil for lard or tallow. I've checked out randhill naturals website and EVERYTHING sounds so inviting. I would love to try rosey toes soap or maybe even the Lovender bar or love haight ashbury bar, honey buzz…gee, I don't know. A person just can't decide! It all sounds great! I like Rosey Toes. I'm looking for the perfect soap for my face with dry skin and my skin is starting to thin. This bar has the combination of essential oils I see recommended elsewhere for use on the face. I would love to try the Rosey Toes, Honey Buzz, or the Love Haight Ashbury Kombucha Bar! Such a cool idea! I'd love to try the Ultimate Skin Quenching Serum since I have dry skin patches on my face sometimes. Sounds like this might really help that a lot. The honey mask and honey wash sound wonderful too! Following you both on Twitter and re-tweeted!